This chapter excerpt offers information on SQL Server Reporting Services 2008 Report Definition Language (RDL), SharePoint integration enhancements and upgrade options. Solutions provider takeaway: SQL Server Reporting Services (SSRS) 2008 Report Definition Language (RDL) has new PageSections, PageSection and PageBreak components that provide solutions providers with more control over page beaks when the report is exported to different renderers. You will also find information on using Sharepoint integration to manage Report Server in SharePoint mode. This chapter excerpt on Reporting Services Deployment Scenarios (download PDF) is taken from the book Microsoft SQL Server 2008 Reporting Services Unleashed. This book can help solutions providers to use SQL Server 2008 Reporting Services to deliver business intelligence services to customers, learn about new features in SQL Server 2008 R2, manage report data sources and models and more. The Textbox report item has been enhanced to support rich text with a mix of fonts, colors, text formatting, styles, paragraphs, hyperlinks, and international complex scripts. 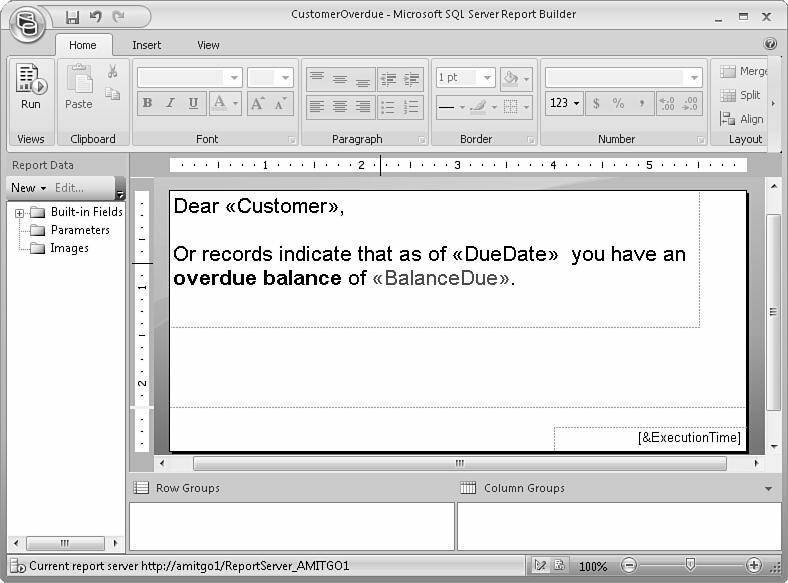 You can import basic HTML from a field in your database for render within the report. Support for rich text opens up opportunities, such as creating template reports that mix data from a database, expressions, and text on the design surface. This might take the form of form letters, notices, invoices, or receipts. Figure 4.24 shows a simple example. To learn more about the Textbox report item, see Chapter 13. Report Definition Language (RDL) has changed in SSRS 2008 to reflect new processing and rendering features such as Tablix, chart, gauge, and the report engine architecture changes. SSRS 2008 RDL has redesigned page elements to provide more control over page beaks when the report is exported to different renderers. FIGURE 4.24 Example of rich text in text box. parent element. New support for KeepTogether and KeepWithGroup has been added to support better control over pagination. In SSRS 2008, processing-time variables can be declared that are global throughout the report or local to particular group scopes. The DeferVariableEvaluation element controls whether a variable is evaluated during on-demand processing of the report. There is a new attribute xsi:nil="true" to distinguish between an element that is explicitly null from one that is not specified. Constants now have data types via the DataType attribute on the Value element. The default is String, but it can be set to other data types as needed. A Teradata data-processing extension was added to SSRS 2008 to enable querying Teradata as a data source for reports and report models. Starting with SSRS2K5 SP2, the core architecture and features for SharePoint integration have been available. The key enhancements added in SSRS 2008 are support for data-driven subscriptions (DDS), URL access parameters, and for the ability to manage a Report Server in SharePoint mode via SSMS. Starting with the SQL 2008 release, SSMS supports management of Report Server in SharePoint integrated mode. You can connect to a Report Server in SharePoint mode by entering the URL to the SharePoint site in the Connect to Server dialog box (example syntax, http://<server>/<site>) and entering the appropriate credentials. For more information about Report Server management features via SSMS, see Chapter 34. DDS are now supported in SharePoint integrated mode (just as they have already been available in native mode). DDS provide a way to dynamically filter results, decide on an output format, and generate a list of subscribers at runtime. Figure 36.17 through Figure 36.20 in Chapter 36 show the new SharePoint UI for setting up a DDS. URL access to the Report Server is available as a way to access individual reports in a customized fashion. This is useful for integrating report viewing and navigation in custom web applications. URL requests contain parameters that are processed by the Report Server and impact how the URL request will be handled. These parameters were not supported in SharePoint integrated mode in SSRS2K5 SP2, but are newly supported in SSRS 2008. See Chapter 35, "Viewing Reports in SharePoint," for more information about using URL access in SharePoint mode. SOAP endpoint namespaces for SSRS2K5 have not changed for SSRS 2008. Therefore, SSRS2K5 clients or custom applications will continue to work against the SOAP applica-tion programming interfaces (APIs). The approach taken for SSRS 2008 by Microsoft was to add new methods to the existing SOAP endpoints like ReportService2005.asmx and ReportExecution2005.asmx. ReportService2006.asmx was added for SharePoint integrated mode in SSRS2K5 SP2, and new methods have been added to it in SSRS 2008 for managing DDS and to list/cancel jobs. NOTE: The Simple Object Access Protocol (SOAP) namespace is the same for SSRS2K5 and SSRS 2008, and new methods were added for SSRS 2008. If you need to write a 2008-compatible custom client, we recommend checking whether a method exists before calling it. This way, you can catch failures if the client is run against SSRS2K5. The SSRS 2000 SOAP endpoint (ReportService.asmx) has been removed from SSRS 2008. It had already been deprecated. URL access continues to work, but if a custom application was built using RS 2000 SOAP APIs, it will need to be ported to use the newer SOAP endpoints. SSRS 2008 has a new Windows Management Instrumentation (WMI) namespace. The 2005 WMI namespace is not supported in SSRS 2008. The old namespace was rootMicrosoftSqlServerReportServerv9. The new namespace is rootMicrosoftSqlServerReportServerRS_ v10 . SSRS 2008 has introduced a new ROM to support the on-demand report-processing changes. It is not backward compatible with the SSRS2K5 ROM. Therefore, if you have written custom rendering extensions with SSRS2K5, you will have to port them over to work with the SSRS 2008 ROM. Custom report items (CRIs) for 2008 have changed from 2005 to sync with the new ROM. There is a new interface for 2008 CRIs, but the 2005 CRI interface remains supported. In the area of server extensibility, a new extension was added called Report Definition Customization Extension (RDCE). It allows customization of RDL at runtime. You can find more information about RDCE in Chapter 29, "Extending Reporting Services." You can upgrade from earlier versions of SSRS to SSRS 2008. An upgrade to SSRS 2008 moves settings out of IIS and into the Report Server. The Report Server database will be auto-upgraded by the Reporting Services Service (RS service). When an older version of the database is detected, you are prompted to upgrade it. If you proceed, the schema is updated to the new format, and you cannot then roll it back to a previous format. The auto-upgrade feature means customers no longer have to create a database-upgrade script (and there's no longer a manual upgrade option in the Reporting Services Configuration tool). Those features from SSRS2K5 have been removed from the Reporting Services Configuration tool in SSRS 2008. NOTE: SSRS 2008 has a new Rendering Object Model (ROM). Therefore, custom rendering extensions from SSRS2K5 will not work with SSRS 2008 and have to be rewritten using the SSRS 2008 ROM. Custom security and rendering extensions block upgrade because there is no way for the installer to determine all the files needed for such extensions. The way to deal with this is to un-configure the custom extensions from SSRS2K5, upgrade to SSRS 2008, and then reconfigure the custom extensions. RS 2000 or RS 2005 RDL can be published to the 2008 Report Server and will continue to work. Older RDL files are upgraded to new RDL when loaded with the 2008 Report Designer. Table 4.1 lists the various report-authoring usage scenarios and the corresponding SSRS 2008 support. RS 2005 RDL, RS 2000 RDL Can publish directly to 2008 Server using Report Manager or the SOAP API. 2005 RDL will be preserved (not upgraded). Report Designer 2000 Not supported; cannot deploy reports to a 2008 server. Report Designer 2005 Authors 2005 RDLs. Can deploy reports to 2008 Server. Report Designer 2008 Will upgrade 2000 and 2005 RDLs to 2008. Deploy to 2008 server only. Visual Studio 2005 Viewer and Visual Studio 2008 Viewer Can view 2008 Server report. 2008 RDLs are not supported in Local mode. Visual Studio 2005 and Visual Studio 2008 RDLC Designer Authors SQL 2005 RDLs. Does not support 2008 RDLs. Michael Lisin has more than 12 years experience in the software industry with expertise in SQL Server and .NET technologies. Lisin is a regular speaker on SQL Server at various events, including SQL Server PASS and SQL Server User Group meetings. Jim Joseph is the co-author of Microsoft SQL Server 2005 Reporting Services and is currently employed by Continental Airlines as a SQL Server DBA. Amit Goyal is the lead program manager for Microsoft's Reporting Services team and is a known expert on SQL Server 2008 Reporting Services. SSRS 2008 has introduced a new Report Server architecture that includes native support for functionality previously provided by IIS. SSRS 2008 has more control over memory management and can page memory to the file system to keep within specified limits. The report-processing engine architecture has changed to improve performance and scalability for large reports and many concurrent users. An on-demand processing architecture and new report ROM provides higher throughput and faster performance for rendering report pages. Even the ReportViewer control enhances performance/scalability by doing some of the work on the client side. A key design goal for the architecture changes in SSRS 2008 was to not break anything. Upgrades from SSRS2K5 are supported smoothly; IIS settings are migrated, and an auto-upgrade is performed on the Report Server catalog. SSRS management tools such as the Configuration tool, SSMS, and Report Manager have been updated in SSRS 2008 to reflect the architecture changes. Report Server SharePoint integrated mode continues to be strengthened via more feature parity with native mode (for example, DDS support). Report authoring has been enhanced via Report Designer and Report Builder 2.0 tools. SSRS 2008 provides new features such as Tablix, Chart, and Gauge data-visualization controls, support for rich text in text boxes, and Teradata data source integration. There is a new renderer for Microsoft Word and enhancements for the Excel and CSV renderers. Printed with permission from Sams Publishing. Copyright 2009. Microsoft SQL Server 2008 Reporting Services Unleashed by Michael Lisin, Jim Joseph and Amit Goyal. For more information about this title and other similar books, please visit Sams Publishing. IBM, Lenovo x86 server deal: Good for partners?